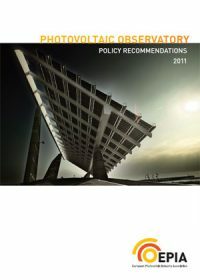 This report assesses the European and global markets for PV in 2012, and makes forecasts for the next five years. It is based on an internal analysis of data from industry members, national associations, government agencies and electric utilities. The figures presented were discussed and analysed by key players from the PV industry at our 8th EPIA Market Workshop in Brussels in March 2013. 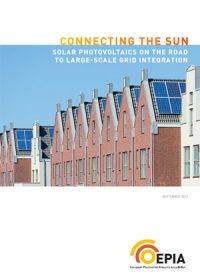 This study aims to provide a holistic vision of how solar electricity will be integrated in the electricity system. It is based on new scenarios for the penetration of PV electricity in 2030. These scenarios have been combined with corresponding wind penetration scenarios. From there, a detailed analysis of balancing needs has been conducted for all 27 EU Member States in order to better understand system operation challenges. At distribution level, the study analyses the main constraints associated with high shares of distributed generation. It also considers the effect that grid integration costs will have on the overall competitiveness of PV against other forms of electricity. This study considers the full cost of photovoltaic electricity generation by using the concept of Levelised Cost of Electricity (LCOE). This concept takes into account all investment and operational costs over the system lifetime, including fuel consumption and equipment replacement. It thus allows a comparison of the cost of producing a kWh of electricity between various generation technologies such as for example PV and a gas-fired power plant – provided all external cost components are also included. To calculate the LCOE, the investment costs, different lifetimes and risk profiles of systems are taken into account, as are the locations of PV systems and their exposure to annual solar irradiance. The deployment of solar photovoltaic electricity (PV) is playing a crucial role in helping the EU meet its commitment in fighting climate change and ensure security of supply, reducing Europe’s dependency on energy imports. In the context of the fast evolution of the European PV market in recent years, the need to permanently monitor market dynamics has led to the creation of the Photovoltaic Observatory. 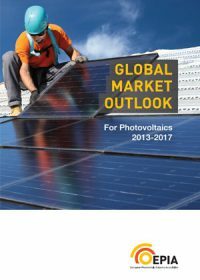 The Photovoltaic Observatory identifies recommended conditions for market development and best practices for the sustainable development of PV by basing its analysis on examining existing policies of several key countries. 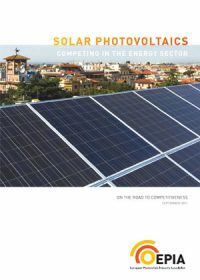 The Photovoltaic Observatory also focuses on relevant regulatory issues, financial incentives, administrative barriers and grid connection procedures.